The high-tech revolution that brought us the Internet and online communication has changed the way people talk to each other and how they buy the products they need. But it hasn't led to a revolution in sales strategies. Despite the explosion of online products and changing customer buying habits, the sales profession still lacks an innovative set of sales practices that really work in the new reality. Enter Sales 2.0, a newer, better way to identify and communicate with today's customers. It's the art of sales with updated best practices for predictable, measurable selling in today's online world. It's not just about using new technology to sell. It's about what works best in concert with Web 2.0 -- customer-centric sales processes, strong relationships, and the strategic allocation of sales resources for maximum profitability. 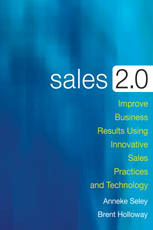 In Sales 2.0, authors Seley and Holloway demystify the emerging Sales 2.0 trend and provide a framework that business leaders and sales professionals can use to implement it in their organizations. They explain why traditional sales tactics no longer work and why you should change the way you sell. They explore Sales 2.0 in practice and showcase four industry-leading companies currently using Sales 2.0 successfully and profitably. They show you how to align your sales resources with customer opportunities to create better sales force deployment and territory coverage. That means segmenting your sales process steps, customers, and opportunities and using the most profitable sales channel or communication medium to engage more buyers. Ideal for sales teams in any industry, Sales 2.0 finally marries Web 2.0 technologies with the innovative sales practices those technologies enable, resulting in improved sales productivity and results. The business of sales is changing; whether your business changes with it will determine your long-term success.